Another Great Mother’s Day Games Rally: CVPC Flintstones are going to Nationals! 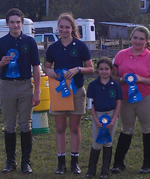 Keeping up with long standing tradition, Connecticut Valley Pony Club held its regional qualifying games rally on Mother’s Day, May 10th. The day started out a bit soggy with rains coming and going throughout the morning, however the weather did not dampen the spirit of the competitors who came from all over the NYUC region to participate. The breadth of the region was represented either through individuals scrambling with local teams, or full teams coming from throughout Connecticut and New York for a fun day of games and camaraderie. 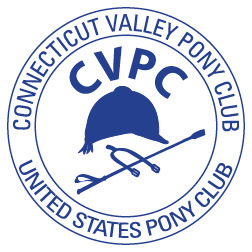 CVPC was so happy to see participating clubs from Connecticut: Bit-by-Bit Stables, Mystic Valley Pony Club and Shetucket Valley; as well as folks from Running Fox and Ridge Riders Pony Clubs from New York. The jog out and horse management inspections were on the rainy side, and judges and teams alike kept up good spirits and rolled with the weather. However, Mother Nature decided to give the day a break and the rains subsided as gameplay began. The Flintstones from CVPC as well as Meghan from Ridge Riders had declared their national intent for Juniors and as play began all eyes were on them. They rose to the occasion and we are thrilled to say that they are all heading to North Carolina later this summer to compete! The grasshopper division was a spirited crew and both teams made their parents proud on Mother’s Day for not only did they compete beautifully but BOTH grasshopper teams out-scored the junior teams in Horse Management. We look forward to watching these girls grow and see how they blossom when they compete as Juniors next year. And the real action was to be seen by the spirited Advanced Pairs division which was a real joy to watch as they galloped their way down the lines. Not to be outdone, the Fossils were a great group, they weathered the high winds that came up after the rains parted and had to keep a handle on horses that aren’t used to games play! And speaking of blossoms, CVPC continued their Mother’s Day tradition of handing out pots of flowers to all the moms who came out to support their children, nieces, grandchildren or just friends. Its a great day to support the Pony Club kids, but also to say a special thanks to the legions of Pony Club moms who do so much behind the scenes. Not only that, there were two great prizes for the drawings that garnered a lot of attention from the crowd: A bucket of horse management goodies generously donated by Cosequin, and, fitting for Mother’s Day, a basket of organic skin care products donated by Rob Robillard and Nourish Organics, a local CVPC friend and supporter. In all it was a great day for moms, dads, horses and Pony Club kids alike – the sun broke through by the end and smiles were seen on faces young and old. The Junior and Grasshopper Teams showing off their accomplishments as well as the fantastic prize bucket donated for CVPC fundraising drawing from Cosequin! A little rain won’t dampen our spirits! Beauty & the Beast? these Fossils look like beauties to us! Overall Grasshoppers: 1st- The Pink Panthers (CVPC,RFPC), 2nd A Bit of Sass (Bit by Bit). HM for grasshoppers – All earned 1st! Better scores than the Juniors!! Congratulations to Cailey, Nick, Fiona, Maya & Meghan who will be doing a lot of practicing as they work on their skills for Nationals in July in NC!! What an amazing performance of the CVPC D Junior Team (aka our beloved Pink Panthers), Mason Harrison, Stella Marsh, Constance Sharp and Helen Sharp at the Granby Quiz Rally on March 5. It was a wonderful day – the Granby pony club organizers set the tone with a warm welcome and a day full of fun and horse knowledge. The CVPC team came in first in their division (by almost 100 points! ), and had some great individual recognition as Team Captain Mason was THE ONLY participant in the entire rally (both divisions!) to get a perfect score on her written test. Not only that, the 1st and 2nd individual score winners in the D Junior division were Constance Sharp and Helen Sharp, respectively. Bottom line it was a great day for the Pink Panthers and for CVPC – they can’t wait to wow them at their next quiz rally. As we gear up for our annual regional games rally coming up on Mother’s Day, CVPC hosted a special two day games clinic with expert Annie Seymour at Fox Ledge Farm on February 27 and 28. Annie concentrated on going over the 2016 games as well as skill sets and vaulting. We had participation from seniors, juniors and grasshopper teams as well as had some guests from Mystic Valley. Everyone had a ball and learned a lot. Highlights were vaulting – many thanks to Misty for being a good sport for all the Grasshoppers to give it a try – and pairing that with balance as we tried our luck at stepping stones. Everyone is excited for our upcoming rally – many thanks to Annie for making time in her schedule to help coach our teams!! Juniors and seniors get some great strategy pointers from Annie. Stella and Annie look on as Constance tries her luck at Stepping Stones. We had a WONDERFUL time at the Harrison’s as they opened their home for a warm and fun holiday party for CVPC. We thank them for their hospitality! The best part was the gift to each member of a felted rendition of their own pony. Such a special gift! As we look toward the new year, here are a few reminders of upcoming events. Dressage for Kids Weekend Educational Program early registration has to be received by 1/15/16. The weekend is January 30-31. CVPC will pay member’s registration fee if doing the early bird registration. Any who register after are of course welcome to join the group but will pay their own registration along with any parents who attend. The featured speaker this year is Event rider Denny Emerson. Another deadline to have in mind is the early bird registration for the Susan Harris Clinic at High Hopes February 19-21. Friday night 2/21 Susan will give a lecture at High Hopes and we will attend as our monthly educational meeting. We need to know how many CVPC members and Parents will attend the Friday night lecture to reserve the space with High Hopes. The link to the flyer is found below so you have more information about Susan and the clinic. With the first day focused on centered riding this is a good lead into the Centered Riding clinic we are hosting on March 20 with Deborah Moynihan. Both Susan and Deborah learned from Sally Swift. The Early registration date for the Susan Harris Clinic is January 26. Anyone signing up after that date will need to go through High Hopes and we cannot guarantee there will be room. We are lucky to have these great educational opportunities near us! Lots of News ahead of the New Year! We hope to see you all at our After the Holidays Party on Saturday, January 10 at the Harrison’s home! We will celebrate 2014 and look ahead to 2015 with our membership. If anyone has not received an invitation please contact Lisa Reneson, Communications Chair. Lisa@twosistersdesign.com. Welcome new members Stella Marsh, Constance Sharp and Helen Sharp! Our January Educational meeting featured speaker will be Andrea Steele, topic Equine Respiratory System, 6:30 pm @ High Hopes. 2015 Activities Calendar is now posted on our website. We have speakers for our educational meetings lined up through March, are part way in to our show jumping clinic 6 month series, and have Cross Country clinics lined up through the season. Dates will be added to the calendar as we add activities. Important for those members wishing to attend the Dressage For Kids Weekend Educational Program January 31-February 1st in Woodbury: CVPC will pay the registration fee for any members who take advantage of the early bird sign up. Remember this is our main educational meeting for the month of February. D4k hires some very talented speakers on a variety of topics. Visit http://www.dressage4kids.org. Pre-registration Fees (checks must be received by January 17, 2015) Adults: $50 for both days or $35 for one day. Youth (21 and under): $30 for both days or $20 for one day. At the Door Fees: Adults: $80 for both days or $60 for one day. Youth (21 and under): $60 for both days or $40 for one day. Mini-WEP (ages 5-10) In advance: $30/day At the door: $45/day. Those members wishing to preregister send your name to treasurer Michele Santoro scrappym@sbcglobal.net by January 14. She will need to have the registration in the mail by 1/15 to insure the preregistration discounts. Shetucket Valley PC has sent info on their Quiz Prep Sleepover, download here. Contact me or go to the NYUC Newsgroup for a registration form. IF you register please let me know so we can track our members participation in PC activities. In November members were invited to audit the Dr. Jenny Susser Sports Psychology Clinic at Fox Ledge for free if they volunteered to man the CVPC tag sale. Several members did and learned some interesting things about riders mental focus. PLUS CVPC received about $80 in tag sale profit! In addition we have had some more items donated. Any CVPC member in need of show clothing stop by Fox Ledge to try on what we have or email Treasurer Michele for a current inventory. We have had two of our 6 month series show jumping clinics with Sally Hinkle so far. Each clinic has had a variety of riders from D-1 to C-2 and quite a variety of ponies and horses. Riders have come from CT Valley, Mystic, Sleeping Giant and Shetucket Valley. Sally has a talent for teaching the basics along with skills for riding courses successfully, All have come away with new skills and tools. The basics she instills are forward and straight into an elastic contact. Hmm, sounds a bit like dressage. Sally will be heading to Florida for her winter training and showing trip on January 24, the date of our next clinic. She has asked Richard Luckhardt to fill in for her. Richard is the General Manager at MVHC and has an extensive resume including USEF “R” judge in Hunters, Equitation and Jumpers, licensed USEF Course Designer, Coach of the Conn College Equestrian team and the US Coast Guard Equestrian Team. Sally told me she always learns something when she watches Richard teach as he teaches from the judges perspective as well. Clinic fees are $55/rider for PC riders, remember to wear your USPC armband. MVHC horses are often available for an extra $20 fee. January 24, February 21, March 14, April 14. Remember also CVPC Mounted Games Practices will start up at the end of January, 1/31. We currently have one practice a month lined up with coach Elizabeth Brown. Other months are on the 4th Saturday. I have also asked her for a 2nd date per month for the following months, February through April, leading up to the NYUC Regional Games Rally May 11. Please contact me with any questions on any of the activities or ideas for future guest speakers/clinicians. I have received the on-line membership renewal material for 2015 and will begin processing renewals next week. For those of you who are renewing members for 2015 (not new members) an email will be sent to you with a link to pay by credit card and the opportunity to update your contact information. Once payment has been received I will receive an e-mail notification that payment has been made. If a member does not have an email address, or does not wish to submit payment online, then a hard copy of the 2015 membership application will need to be completed and submitted through the club, with payment postmarked by November 15 in order to avoid the $10 late fee. Please review the membership list included in this e-mail and make sure your e-mail information is current. Unless I am instructed otherwise, all renewals will be sent to the e-mail listed under the parent contact if the member is under 18. For members over the age of 18 membership renewal will be sent directly to them. Please send any updates to me as soon as possible. For those families that are new to our club (and haven’t already joined), the membership forms for 2015 can be found on the USPC website under Publications/Forms or on our CVPC website here. All membership renewals are due to the National office by November 15th or they will assess a late fee per member. Even though there are benefits associated with renewing on-line, members are not able to pay for their regional/local dues at the same time. I will be collecting regional/local dues ($35) per family at our annual meeting in October. Please bring a check payable to CVPC or cash to the meeting on October 24th . Please let me know if you have problems renewing your membership on-line or run into other problems. The national office is very responsive and can fix anything! Due to several date conflicts the June monthly meeting will be held on the 2nd rather than 3rd Friday. We will meet next Friday the 13th (!) at Fox Ledge at 6:30 pm. The educational topic is the conformation & anatomy of the lower limb. All members please review your rating checklists for the level of knowledge you will need at your desired rating. Thank you to the Fay family for providing meeting refreshments. The CVPC Annual Meeting is the third Friday in October. Next week at our June meeting, the Parent Sponsors will need to elect a Nominating Committee who will present a slate of Officers for the Election for 2015 to be held at the October meeting. I have asked Leslie Gourlay to head up the Nominating Committee. Any parents interested in serving on the Nominating Committee or in any Board position please contact Leslie Gourlay. Officers are District Commissioner, Co-District Commissioner, Treasurer and Secretary. Board appointed positions are Membership Chair and Communications Chair. All positions are one year terms, no limit to the number of terms. With July 1 rapidly approaching please review the program ad requests for the Lyme Horse Trials. Remember this is our club’s major fundraiser and every ad you sell helps! Ask any of the people you are in contact with who know or might want to know about your involvement in Pony Club. All members received a packet of information on the program ads. If you need another please let me know. For those members interested in the D Achievement Badge program, please refer to the Badge Program page of our website. The workbooks are available to download or can be purchased through USPC’s store. The workbooks follow the USPC Standards of Proficiency, so as members earn badges they will be working toward the knowledge for their next level of certification. With school closing soon for the summer I would like to line up the older PC members to help teach and run badge sessions. CVPC has the Instructor Workbooks. Please let us know how many members will be attending the meeting next Friday.